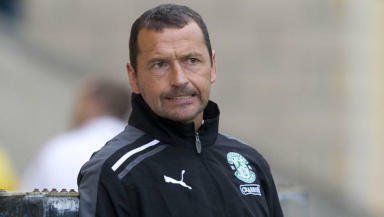 Hibernian boss praises players for second-half comeback. Colin Calderwood has targeted improving Hibernian’s leaky defence after watching his side produce a spirited comeback against Dundee United. The Easter Road side looked set to suffer their fifth SPL defeat of the season after falling 3-1 behind before an own goal from Scott Robertson and a Junior Agogo strike secured a 3-3 draw. In-form striker Garry O’Connor had given the Leith men the lead, but a double from Jon Daly and a Danny Swanson goal exposed the capital club’s defensive frailties. And dealing with those issues is now at the forefront of Calderwood’s mind. He said: “The players have to take the credit because we were really under the cosh during the second half. “I think we've got out of the fire a little bit, because we didn't play well in the second half. “But our second goal has created a spark and when we got the third goal we had the momentum. “If there was to be another goal in the game I wouldn't have been surprised if it was for us. “We livened up after the goals, but we looked too vulnerable. Dundee United could have scored first, easily. “I think we are leaving ourselves too open, we are giving our defenders a tough task.